Clinical Diagnostic/MDx Sales Rep Jobs. 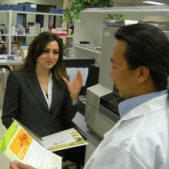 Do you have a Life Science or MedTech degree? Many jobs are "filled" each month by members of this list. New Jobs are sent to over 13,000 sales reps (70%) and scientists (30%) looking for the perfect Biotechnology R&D Sales,Marketing, Product Mgr, FAS, FSE, MDx and CDx Sales job for yourself or a colleague.